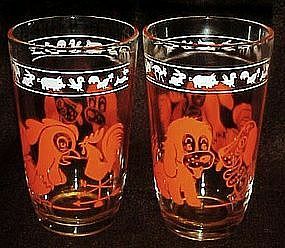 Swanky swig orange rooster and dog kiddie kup 3 3/4"
Swanky Swigs were originally used by the Kraft Food Company for cheese spreads. When empty, the glass could be washed out and used as a juice glass or small tumbler. They were introduced in the early 1930s and brightened up many tables during the Depression. They came in many colors and patterns. This one is theorange Kiddie Kup, featuring roosters and puppys. Measures 3 3/4 inches tall. It is in perfect shape with no chips or cracks. No damage to design, it is nice and bright. I have 2 available. Price is for each.